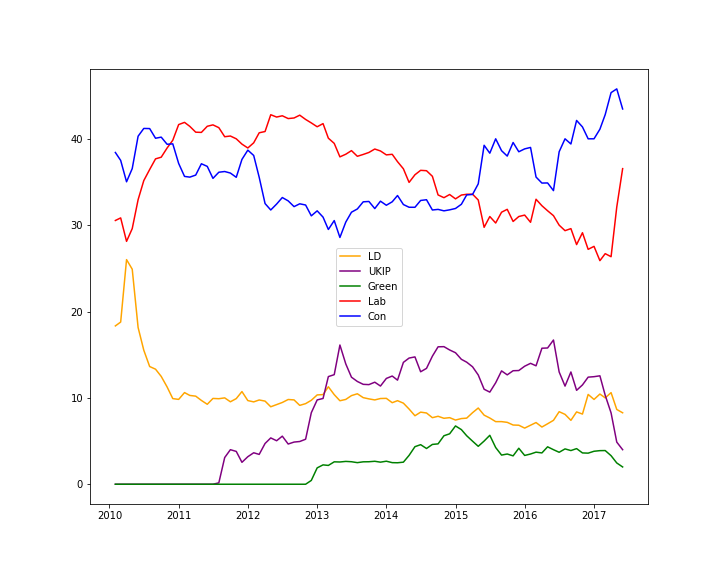 My previous post described a web-service for providing up-to-date UK political polling information. I’ve created a Python client to make use of this to perform simple analysis. This allows you quickly do analysis such as polling a monthly average of the parties polling results. This can be generated using code like this. Or another example, list the months in which Labour had the lowest average poll rating while in opposition. And the code for this. There are some notebook files on github here which illustrate the interface and provide further examples of what can be done. Please see my previous post about crediting the sources of this data. This entry was posted in Polling, Python. Bookmark the permalink.